Sony mylo personal communicator, which the name mylo means “My Life Online”, is a handheld mobile communication gadget that combined features and ability to instant messaging with Yahoo! Messenger, Skype and Google Talk, and other internet-based communications such as web browsing using Opera, wireless phone, digital media player that allows playback and sharing of media files of audio, photos and videos. 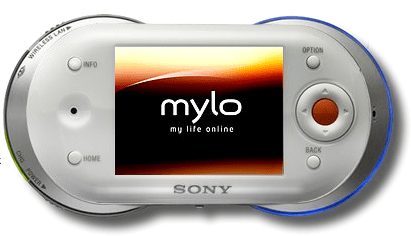 Sony mylo features a PSP-esque LCD screen which slides up to reveal a QWERTY keyboard, and usage of Wi-Fi instead of cellular networks (GSM, CDMA or 3G) to connect to the Internet. Washington Post reviews Sony mylo and concludes that the Mylo is the latest device looking to blur the lines between phones, computers and media players. It’s a cute gadget that does what it sets out to do, but is it worth investing in a device that’s only fully functional at Wi-Fi hotspots? Students living and going to class on a Wi-Fi-enabled campus might think so, but $350 is a hefty initial investment even if you’re saving on monthly access fees. The Mylo’s future might depend on whether it becomes known as the next cool gotta-have gizmo. Digit reviews Sony mylo and concludes that Sony mylo is an interesting gadget for a very targeted audience. It works well as a Skype phone and acceptably as an instant messaging device if you use the supported IM services. However, there are cheaper devices that provide these capabilities as well as or better than the mylo (including Sony’s own PSP). As it stands, $350 seems to be a premium price for the features currently supported.